Only “deep budget cuts”?! — don’t go soft on us now, Dan. Defund! the Marxists in international organizations… [drawing large tax-free salaries… funded in large part by the American Taxpayer…] are socialists…. they are NOT our friends… and the idiot politicians who fund that nonsense year after year… should be tossed out… with the money redirected to help fix entitlements… or for some other cause that will directly benefit the American people…the international Marxist bureaucrats who are dedicated to the cause of global socialism… see our politicians as useful idiots… we desperately need TERM LIMITS… and a serious re-think of how we spend our money…. Gotta wonder why they’r e so mad about us kicking people out who are trying to get into this “bad” country. And from their own words, it seems those held at the border are in better hands than those in poverty. Shouldn’t we just keep them at those mansions at the border rather than release them to a life of sure poverty? Why are we continuing to support international organizations? We continue to get our teeth kicked in, and we pay by-far the most. This issue of measuring RELATIVE poverty (e.g., under 50% of median income, as mentioned above) instead of ABSOLUTE poverty is a huge pet peeve of mine. They can be enormously different. Poor people in ABSOLUTE poverty actually have a low standard of living. Poor people in RELATIVE poverty may or may not have a low standard of living. Imagine the US continues to grow and prosper, and median income expands to $200,000 (in today’s dollars). This is not far-fetched, and it could be the case a century from now. In that happy future, RELATIVE poverty would include anyone earning less than $100,000 in today’s dollars (50% of median). That is utter nonsense. 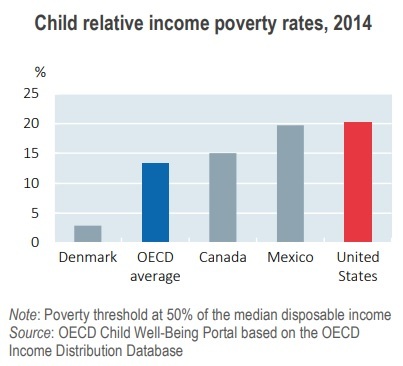 ABSOLUTE poverty matters greatly. RELATIVE poverty is just more Marxist class warfare propaganda. I agree. It is time for the U.S. to drastically reduce our support of the United Nations. The organization has become a farce. An even bigger problem with the report, especially given that the organization attacking American policy is the U.N., is that the Census Bureau data for 2016 isn’t accurate and can’t be used to compare U.S. anti-poverty programs with programs in other developed nations. The Census Bureau makes its annual estimates of Americans’ well-being by sending out thousands of surveys. Many households don’t respond to these random surveys. Of the people who do respond, those who receive federal, state or local government welfare assistance significantly underreport what they receive. This isn’t necessarily fraud, because the random surveys don’t determine eligibility for government assistance. Rather, it simply shows that when struggling families receive the survey asking what they earned in the prior year and what welfare payments they received, they often simply don’t know. The problem of inaccurate census survey responses has been known for years and has been studied by both government officials and academics. A recent study by Bruce D. Meyer and Nikolas Mittag found a huge mismatch between census data and government money spent on behalf of poor people involving four programs in New York: food stamps (the Supplemental Nutrition Assistance Program, known as SNAP), Temporary Assistance for Needy Families (TANF), general assistance and housing assistance. That’s an enormous level of errors – making the survey results practically worthless.